Puzzler magazine always comes with a free pen, so you can get started there and then. It also features competitions you can enter to win big prizes with your puzzle brilliance. Puzzler magazine always comes with a free pen, so you can get started there and then. It also features competitions you can enter to win big prizes with your puzzle brilliance. This magazine is ideal for the train, a rainy day, or just to keep your brain buzzing! If you love puzzles, then puzzle over this Puzzle Corner Special. Puzzler has more than 170 different puzzles of all types with every monthly issue, including all your favorites like crosswords, Puzzle Corner Special, code words, word searches and criss crosses, as well as logic problems, sudokus, cross-quizzes and skeleton crossword, and many more we don’t have room to name! Puzzler brings you the most puzzling puzzles every month. There are conundrums for expert puzzle solvers: the most clever cryptic crossword connoisseurs will be challenged by these, and something for the children and those who like to take it a bit easier as well, like word searches and spot the differences. There are all levels of Sudoku, including the Killer Sudoku, guaranteed to kill or cure you. Either way, you won’t be able to stop thinking about it! Puzzlers are a sea of puzzles that are your entire favorite. Now it’s possible to get all puzzles in this one fantabulous magazine, which comprises of band new puzzles with every issue! Gone are the days when the classic Sudoku was the talk of the town. Puzzler has added a whole other dimension to Sudoku puzzle solving. If you are tired of solving the easy and oh-so predictable classic Sudoku puzzles, think twice. 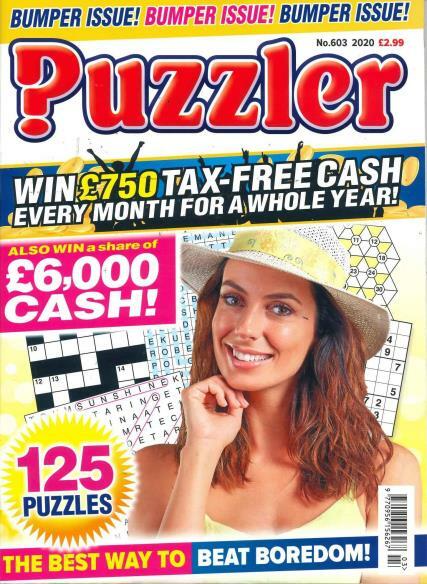 Puzzler, puzzle solving magazine has the deadliest yet the most fun to solve Sudoku puzzles. The Arrow words puzzle really helps in developing the vocabulary skills of an individual. You will learn more words and know exactly how to put to use all those more words that you are learning.